Hetman of the Zaporogian Cossacks, born about 1595; died at Chigirin Aug. 16, 1675. Unlike many other Little-Russian pupils of the Jesuits, Chmielnicki did not embrace Roman Catholicism, but early in life became a champion of the Greek Orthodox faith, to which most of the Cossacks and the Little-Russian peasants belonged. While still in the subordinate position of a "sotski" (an officer over a hundred) of the Cossacks, subject to the Polish magnate Koniecpolski, he was deprived by Chaplinski, the bailiff of Chigirin, of his estate of Subotovo. Chaplinski availed himself of Chmielnicki's absence to make araid on the place, during which the young son of the owner received injuries from which he ultimately died, and Chmielnicki's (second) wife was carried off. In this raid Chaplinski was aided by the leaseholder of Chigirin, the Jew Zachariah Zabilenki. At another time, it is related, a Jew reported to the Polish government a secret treaty concluded by Chmielnicki with the Tatars. These personal indignities and injuries embittered him against the Poles and the Jews. Still, he was not without friends among the Jews themselves; for, according to Nathan Hannover, the Jew Jacob Zabilenki—possibly a relative of Zachariah—aided him to escape from prison when arrested by Koniecpolski. It appears, therefore, that though his personal resentment influenced his decision to rid the Ukraine of the Jews, yet there is little doubt that it was his great ambition to become the ruler of the liberated Ukraine, which was the main motive that led him to instigate the uprising of the Little-Russian people against the Poles and the Jews. For years the people of Little Russia had been oppressed by the Polish landlord. Unwilling to attend to the details of administration himself, Chmielnicki made the Jew a go-between in his transactions with the peasants of Little Russia. He sold and leased certain privileges to Jews for a lump sum, and, while enjoying himself at the court, left it to the Jewish leaseholder and collector to become the embodiment of hatred to the oppressed and long-suffering peasant. The accumulated store of animosity was utilized by Chmielnicki in directing his cruel measures against the Jews. 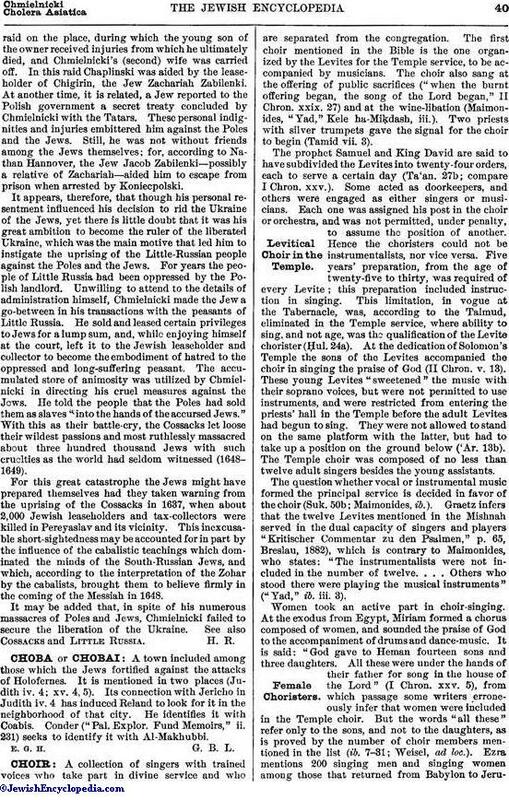 He told the people that the Poles had sold them as slaves "into the hands of the accursed Jews." With this as their battle-cry, the Cossacks let loose their wildest passions and most ruthlessly massacred about three hundred thousand Jews with such cruelties as the world had seldom witnessed (1648-1649). For this great catastrophe the Jews might have prepared themselves had they taken warning from the uprising of the Cossacks in 1637, when about 2,000 Jewish leaseholders and tax-collectors were killed in Pereyaslav and its vicinity. 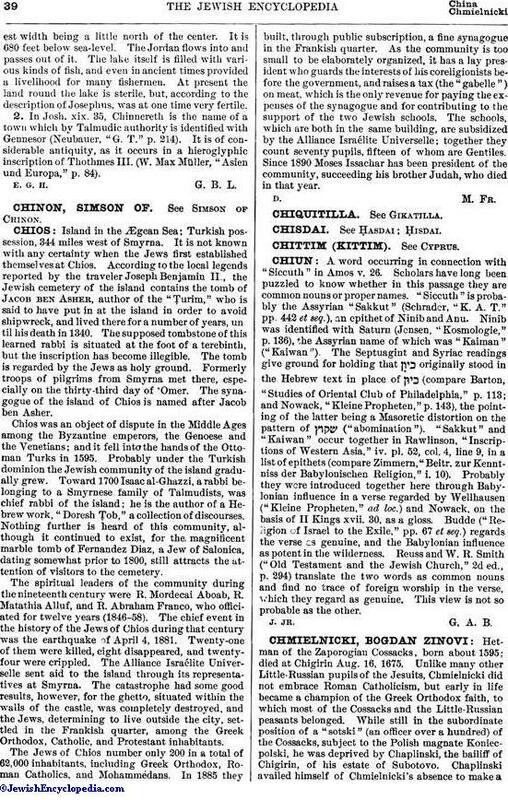 This inexcusable short-sightedness may be accounted for in part by the influence of the cabalistic teachings which dominated the minds of the South-Russian Jews, and which, according to the interpretation of the Zohar by the cabalists, brought them to believe firmly in the coming of the Messiah in 1648. It may be added that, in spite of his numerous massacres of Poles and Jews, Chmielnicki failed to secure the liberation of the Ukraine. See also Cossacks and Little Russia.